Today is the anniversary of the passing of a great American wordsmith. On this day, February 26th, 20 years ago in 1994, the world lost the great Bill Hicks. Twenty years gone. But not forgotten, and his voice is stronger and louder than ever. Amazingly relevant despite being dead for two decades. Let me explain. I accidentally discovered Bill Hicks back in 1993. I had gotten home really late after having been out partying with some friends. I had a slight buzz and was feeling good, so I got into bed at around 2:00am and I turned on the tv and began flipping through the channels. That’s when I noticed an HBO or Showtime comedy special, which was about to start. I figured a little bit of comedy as I drifted into sleep would be a nice way to end what had been a fun evening. I had no idea the magnitude of what was about to happen to me. What happened next has stayed with me throughout the entirety of my life. What I was treated to, of course, was the now well-known Bill Hicks comedy special, called “Revelations”. Within 10 minutes, I was hooked on Bill Hicks! He had instantly become my new hero. The addiction has lasted throughout my life up to this point in time. Ever since that night in 1993, I have made it one of my missions in life to continue to spread the Word of Bill, hence this missive. Bill was a truth teller of the highest magnitude. Scathing social commentary, delivered mercilessly. However Bill had a way of making his often ugly subject matter very funny. And insightful. And delivering it in a way that it made it stick with you so you could never forget. His words and observations had the power to get you looking at life a little bit differently. Below, you will find a series of links to YouTube videos featuring Bill on a number of topics. 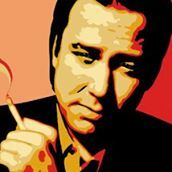 Below that you will see a store that I have created where you can go to purchase Bill Hicks books, DVDs, CDs and merchandise. We need more voices like Bill Hicks. Now more than ever! Long live the Word of Bill! Sane Man is my all time favorite. Filmed in 1989 at the Laff Stop in Austin Texas. Bill was only 27 years old, and at the top of his game. And freshly sober, too. An amazing piece of work. Bill was an extraordinary guy. Filmed in Montreal Canada, I believe in 1990 or ’91. Are You Going to Burning Man this Year? Are you aware of how you come across to your friends and camp mates when it comes to Burning Man? This little video might give you some food for thought. Slayer vs. the lord – Who Says Religion and Rock and Roll Don’t Mix? Heavy metal music and religious zealotry are not know for being passionate bedfellows. Until now! Watch as exalted bible thumpers thump their heads to heavy metal music, featuring metal masters Slayer. Sure to make you smile and thank the lord! What’s that you say? It’s not possible. Watch this and reconsider…. So there’s hope for the 3rd Reich after all. Burning Man may never be the same. Is that a good thing? Nick Margerrison is the host of The Night Before will interview Bill Hick’s producer/ friend/ biographer Kevin Booth on the 14th anniversary of Bill’s passing. Topics will include – Mushrooms – Flying Saucers – Waco – Bill’s longevity and a plug for a live tribute show for Bill taking place in NYC Feb, 26.